Signia builds upon the innovations of its sister brands, and its debut hearing aid primax has been proven by independent studies to reduce listening effort throughout the day. Signia primax offers features such as SpeechMaster, HD Music, and EchoShield for an optimal listening experience. In 2015, the University of Northern Colorado conducted a study on speech recognition, using Signia primax hearing aids. Results found that participants experienced a significant reduction in listening effort, with a particular emphasis on speech recognition. Primax was built, in part, on the binax and micon platforms from Siemens; binax was proven to outperform normal hearing in challenging listening situations. Signia primax reduces listening effort and addresses the many aspects of hearing loss with three main features: SpeechMaster, EchoShield, and HDMusic. SpeechMaster improves speech recognition through a combination of noise reduction, directionality, and steering amplification. SoundSmoothing assists in a more comfortable listening experience. EchoShield protects sounds in acoustically difficult spaces, such as atriums, lobbies, and hallways. In these spaces, sounds and speech may reverberate, causing distortion and discomfort. EchoShield analyzes these sounds, deflects louder sounds, and softens sharp noises. While most traditional hearing aids focus on noise cancellation and speech recognition, Signia primax takes listening a step further with HDMusic. HDMusic is designed with three features for different music listening scenarios: Live Music, Recorded Music, and Musician. Signia primax is available in a number of styles (receiver-in-canal, behind-the-ear, and in-the-ear), with three performance levels for different degrees of hearing loss (3px, 5px, and 7px). For those who experience tinnitus, Signia primax is equipped with tinnitus therapy (static noise and ocean wave sounds). For those with single-sided hearing loss, primax is available in CROS and BiCROS models. Signia Silk follows the trend of hearing aids growing smarter, faster, and more discreet – and it is the first ready-to-wear aid on the market. 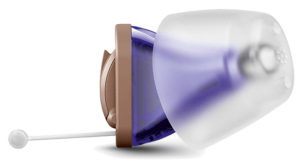 Silk’s groundbreaking contribution is the Click Sleeves, silicone pieces that click into place on the completely-in-canal (CIC) primax hearing aid. With six varieties of Click Sleeves, Signia Silk will fit into most ear canals. While older varieties of CIC aids require a mold to be taken of your ears, Signia Silk allows first-time wearers to walk out with brand new aids in their ears – with immediate access to clear sound and all of the benefits of hearing aids. Signia Silk sits deep in the ear canal, where it provides both comfort and discretion. Click Sleeve’s design provides ventilation and a high level of comfort. The comfort and flexibility of Click Sleeves eliminates the customization and crafting time of traditional hearing aids. Smart color design (blue for the left ear, red for the right) makes the listening experience even more convenient for first-time wearers. 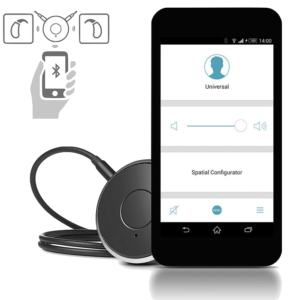 Silk hearing aids are wireless and digital, and are compatible with a number Signia accessories (see below). Responding to a call for more sustainable energy solutions for hearing devices, Signia offers the brand-new Cellion primax. Cellion primax, a receiver-in-canal aid, uses one of the most advanced battery technologies to date: lithium-ion. Cellion is the only inductive, wireless, and contact-free rechargeable hearing aid on the market, and is also one of the smallest RIC hearing aids available. Cellion is powered by lithium-ion technology, which is commonly found in advanced electronics such as cell phones and laptops. With a USB charger, Cellion requires four hours of charging for uninterrupted 24 hours of listening. A 30-minute fast charge provides seven uninterrupted hours of listening. Cellion primax offers all of the features of the primax platform. All Signia primax aids have wireless capabilities as well as connectivity with Signia accessories. Signia primax’s TwinPhone feature uses a wireless connection to stream conversations directly from a smartphone to the wearer’s hearing aids. With the touchControl app and remote control, and through smartphones with the easyTek app, wearers may easily make adjustments to their primax listening experience. For extra enhancement, Signia primax users may look into a line of accessories, compatible with easyTek. The TV Transmitter is convenient for use in home entertainment systems, streaming audio from your favorite TV shows and movies directly to your Signia aids. VoiceLink is recommended for use in challenging noise environments where one needs to hear speakers’ voices clearly, such as classrooms or meetings. VoiceLink is a microphone that streams amplified audio directly to your Signia primax aids. For non-smartphone users, Signia offers two remote control options which are discreet and simple to use. The easyPocket remote control offers large buttons and easy-to-read display, making it easy for wearers to control their listening experience. The miniPocket is small enough to fit on a key ring, but allows wearers control over essential features of all Signia primax models.